HIGHLAND PARK, Ill — This year, an estimated 137,000 people will be diagnosed with leukemia, lymphoma or myeloma, according to the Leukemia & Lymphoma Society (LLS). Additionally, one person is diagnosed with blood cancer every four minutes. 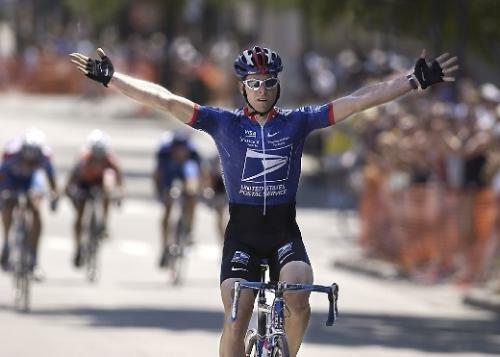 In an effort to help reduce those numbers and find cure, residents of Highland Park gear up for the annual Blood, Sweat & Tears (BST) bike ride on Sunday, Oct. 3.
International pro cyclist Robbie Ventura, two-time winner of El Tour de Tucson in Arizona, will lead the charity ride starting at 7 a.m. near the Highland Park Train Station. Several hundred riders, both professional and amateur, are expected at the event, according to Dan Jerger, of Team in Training – LLS Illinois Chapter. Ventura, a former US Postal-teammate of Tour de France champion Lance Armstrong, will be riding in tandem with the highest BST fundraiser and contributor, said Jerger. The charity ride has a rolling start, so people can register and depart at any time between 7 a.m. and 10 a.m., Jerger added. Jerger is encouraging recreational riders and their families to get involved, and help find cure for cancer. There are options for all riders: 5-mile family fun ride, 20-mile ride, 45-mile ride, 62 mile ride and 100-mile century ride. Registration is $40 and $10 for children. All routes are on paved roads and the rides are “well supported,” Connolly added. Over 225 riders have already raised $40,000 from the BST ride, which is now on its eighth year. This is the second year the event is held in downtown and co-sponsored by the Downtown Highland Park Alliance, said Sarah Wiebenson, executive director of the merchant organization. “They (BST organizers) really liked the idea and they tried it out for the first time last year, and we’re thrilled to have them back for a second year in a row,” she said.